NASA’s Juno spacecraft has once again delivered stunning images of Jupiter, this time giving us a glimpse at the gas giant’s south pole. The image, taken from Juno’s most recent flyby on February 2nd, was captured at an altitude 63,400 miles. While there aren’t any Jovian penguins on this south pole (that we know of), we can clearly see magnificent, swirling white clouds. Juno’s next close flyby is scheduled for March 27. Though the initial plan was for Juno to be in 14-day science orbits by now, it’s still stuck in a 53-day orbit, following an engine malfunction back in October. For now, Juno will continue in 53-day orbits in order to collect as much scientific data (and as many pretty photos) as possible. We’re not complaining. 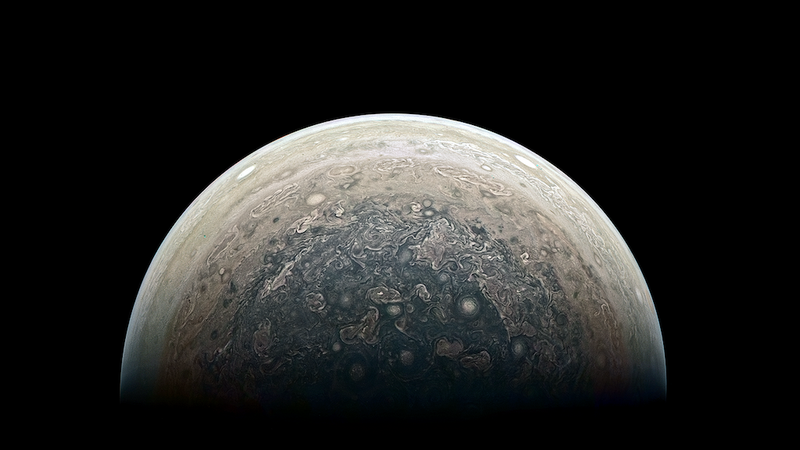 If you’d like to enhance some images yourself, you can check out Juno’s gallery here.